Lead the way with the latest in imaging technology. 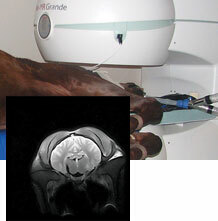 Universal Systems offers two Equine Specific MRI Systems, Vet-MR Grande Brio and Vet-MR Grande XL, providing your practice with the technological Animal Imaging advantage needed in todays challenging marketplace. 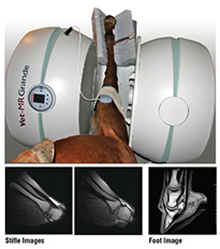 Vet-Mr Grande XL, the world’s first ROTATING Veterinary MRI scanner designed specifically for horses, providing a flexible solution to your equine imaging challenges. The Vet-MR Grande XL System delivers superb diagnostic images to the practitioner who needs clear answers to problems in the foot, carpus, tarsus, hock, brain, sinus & neck with remarkable cost effectiveness and ease of use. 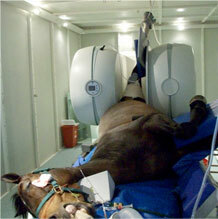 The complete Vet-MR Grande XL Equine MRI system includes a customized Veterinary MRI unit in addition to a patented in room RF cage and a robust SS equine table designed to have your MRI diagnosis and treatment functional tomorrow. Patient positioning is optimized using continuous visualization features. Patient monitoring is very easy as the animal is accessible during the exam reducing any risk for the patient.